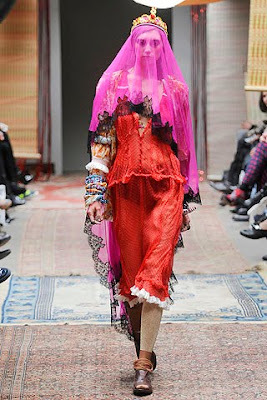 Meadham Kirchoff's fall collection is SO next level EPIC that I can't even handle it. 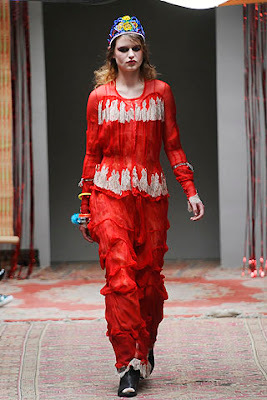 It's like a cooler, more careless Comme des Garcons vibe. 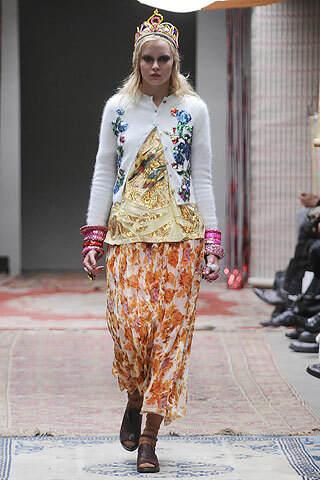 Its vver-the-top girly and defiant in its bold colors and more-is-more layering. Why not wear a silver crown under a long lace veil? The multicolor bangles under all that lace are a FANTASTIC pop of color. 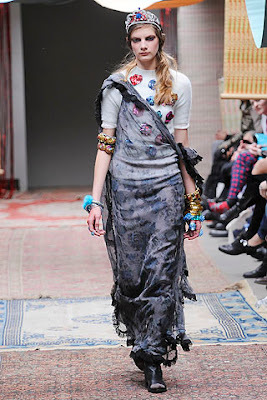 This is so 90's grunge girl gone LUXE and its giving me heart palpitations. The colors are so bright and they don't even match a little bit and the whole thing feels so REAL. 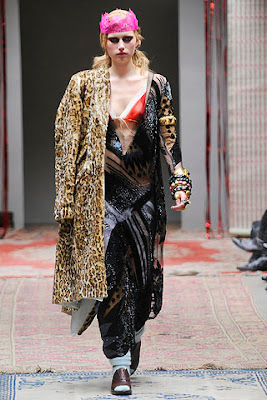 Shiny huge polka dots, floor-lengths, crowns, leopard print, triangle bras, hot pink, sparkly fabric. Pink veils trimmed in black lace, white ruffles on red skirts, bangles, bangles, bangles, red, red, red. We should all have this much fun when dressing up. all of it is like a closet threw up, but a really DOPE closet. the last one looks like a big mouth open! this collection is a perpetual heart palpitation gone good. or something.